I have a new favorite song. 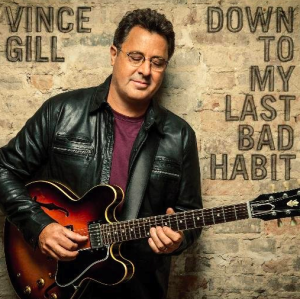 Vince is back with a new song and new album this year, which is pretty cool. And I think this song is pretty killer. Vince still has that smooth voice. Nobody in country had a voice like him during his heyday. And I don’t really think we’ll ever have another one like him. I think David Nail kind of comes pretty close in his own cool kind of way. Talk about soul in this song. I don’t know if that was the point, but this song is really some Soul Country. Vince has always had that style and it really comes on strong in this one. The song is about a guy that has given up his bad habits over the years. It sounds like he’s mellowed a bit. He’s changed some. And it turns out that those things were the reasons, at least as he sees it, that his girl left him some time back. So that’s all of his habits gone except for his last one…her. And it’s kind of cool that he recognizes that having her was a bad habit. He knew it probably wouldn’t work out, but he can’t help loving her. It’s something he yearns for and needs. Vince is back. I don’t know what the expectations are for this one on radio, but it would be really cool if it became a hit.